Many urban centers call themselves "Garden City," but thanks to its many manicured parks filled with native and exotic plants, Victoria probably deserves than moniker more than most. A trip to Victoria lets you discover a photogenic regional capital that serves as one of the safest and most livable seaside cities in the world, where restored 19th-century architecture creates a perfect balance with modern architectural gems. On the southern tip of scenic Vancouver Island, this highly walkable city of just 80,000 residents provides quick access to both water-based activities and adventures in rugged mountain terrain. With pristine nature never more than a short drive away, you can spend you Victoria vacation hiking, biking, sailing, kayaking, and whale-watching right from the city center. Victoria is in Victoria Capital Regional District. 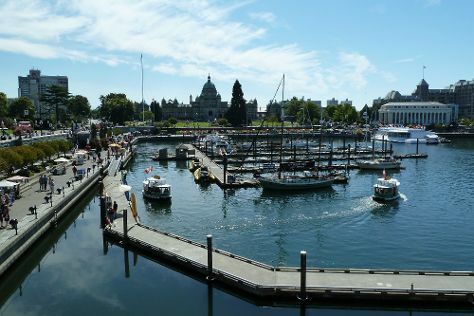 Use our custom trip planner: Victoria and all its delights await. The curling waterfront Wharf Street, which becomes Store Street, offers the best selection of lodgings in the city center, although you can expect to pay extra for the trademark views. Many travelers opt to stay in the neighborhood of James Bay, where Belleville Street and surrounds provide comfortable and even luxurious options. For something more relaxed and closer to nature, look south to the expansive Beacon Hill Park.